(March 24, 2014) — Students in introductory-level chemistry courses at the University of Kentucky now have a resource focused on their success. 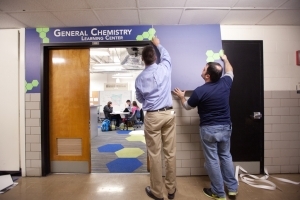 The General Chemistry Learning Center at UK provides introductory assistance to any student taking the courses, including Chemistry 105, with its inaccurate reputation for being a difficult class that "weeds out" students. Lisa Blue, the center's coordinator, says students need to know that help is available. "I don't want students to feel like Chem 105 is a weed-out course in the least," Blue said. "I want them to understand that there are certain critical thinking skills that, as a card-carrying chemist, we want them to walk out of that class having. So, we're going to do anything we can to reach out to the students to help them be successful." 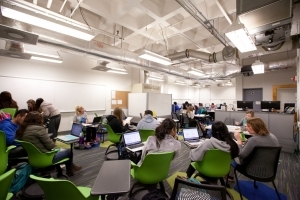 The effort to reduce the number of students receiving D's and E's, or withdrawing from general chemistry courses, began roughly 10 years ago with teaching assistants and general chemistry students meeting at a table in the computer lab of the Chemistry-Physics Building. Today, there is a dedicated learning center located in Room 133. Joy Kim, a freshman studying human health sciences, says the learning center helped him learn how to write general chemistry lab reports. "The TAs at the learning center were especially helpful in teaching me the right format," Kim said. "The learning center has been a time-management tool for me. I try to prepare my lab reports and complete Mastering Chemistry homework beforehand so that I can take any questions to the learning center. It is comforting that such help is available on campus." The center is staffed by general chemistry teaching assistants on a drop-in basis. Last fall, it grew, both in size, to a 49-seat facility, and in the number of teaching assistants available to accommodate an expanding university, College of Arts and Sciences and Department of Chemistry. "I think that we'll just continue to grow," Blue said. "We'll figure out ways we can more efficiently work with the students, so we can reach a greater number of students effectively." The Organic Chemistry Learning Center has also opened in the Department of Chemistry to assist students with introductory organic chemistry classes. The 12-seat facility is located in Room 25 of the Chemistry-Physics Building. Blue says her main objectives are to increase students' awareness of the resources offered, to encourage them to reach out to professors, and to get them to come to the learning center to improve their skills and learning experience. Whether they want help with study skills, test anxiety, concepts or lab reports, Blue wants students to take advantage of every resource so that they can be successful. The General Chemistry Learning Center is open 9 a.m. to 5 p.m. Monday through Thursday and 9 a.m. to 4 p.m. on Fridays. The center is closed on Fridays during final exam weeks. Learn more about the Chemistry Learning Center on a special A&S podcast featuring Lisa Blue.